Great idea! How do you identify all their little socks and undies, etc. etc.? We've only got one kid, and I have a hard time keeping track of all his little bits and pieces! So clever! When I went to buy sandals for my daughter, there was exactly one pair that didn't light up, have a heel (she's not yet 4), or cause her whole foot to slide all over the place. There was still plenty of selection - I suspected that my bedrest would be imminent and wanted to have whatever I needed for the summer. I finally found a cute white fisherman-type sandal closed on almost all sides that was the only style available in a narrow. What a relief! I do the same type of thing. I purchased matching flip-flops for my girls last year, and wrote their firt initial (A and B) on the back fo the sole. You can't see it unless you look for it, but it tells us whose is whose...no more fighting! 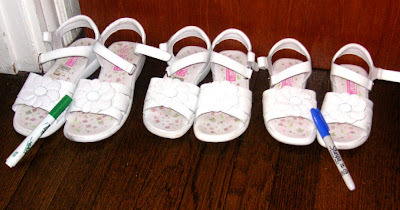 This year it was very hard to find good sandals for my granddaughters. Thank you! Three of the girls are very close in age and size, so keeping track of the other items is a real challenge for us, too. I try to avoid socks for the girls. They wear stockings in the Winter, and sandals in the Summer. Socks are hard to match. Three years ago, for my husband's birthday, I removed all his socks and my son's socks, and bought 60 pair of one brand for my husband, and 60 pair of a different brand for my son. They only opened a dozen pair each to start. This obviated the need to match socks and solved the mixed up distribution problems for both of them in one fell swoop. Mostly, I ask the girls to sort out their small bits themselves. It's too hard for me to keep track, and they KNOW whose is who's. I don't know why it's so hard to find normal, simple, standard sandals (or regular shoes for that matter). I know we're in the minority, needing dress-up/shabbat shoes that a kid can wear to walk a couple of miles and run and play. Still, who buys high heels for preschoolers? Thank you! You made my day with your compliment! I'm honored to be counted as your new friend. Thank you. We try to avoid the matching shoes, but sometimes, that's all that's available. At Hannah's 10th birthday party last year, one of the activities was to decorate flip flops. The girls had a blast. Tell me about it! We had to go to three stores before we found normal sandals in enough sizes. We eventually found these at Payless.